So my friend was very pregnant, and craving fruit, and convinced her husband to take her via motorbike to the market. Having but one helmet between them, somehow they decided that it was best if t would be worn Ryan who was driving, while our pregnant damsel held onto his waist. Unsurprisingly, this attracted the attention of the police, who promptly pulled them over to question their judgment. 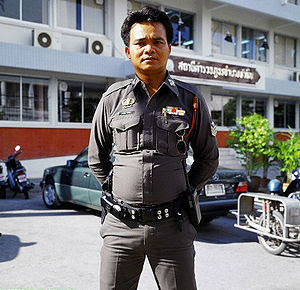 Amenable and apologetic, they paid the fine of 300 baht directly to the policemen, as is the custom in the country. They continued on to the fruit market, and upon arriving, realized that they had no money left to spend. Lacking bank cards, instead of returning home, they went back the short distance to the original policeman, nicely approached him, and asked if they could get a rebate so that they could afford some fruit. He pulled 100 baht out of his pocket, and handed it to them with a smile.